Search for all "Roactemra (Tocilizumab)"
Mouse anti Human Roactemra (Tocilizumab) 105D9.05. 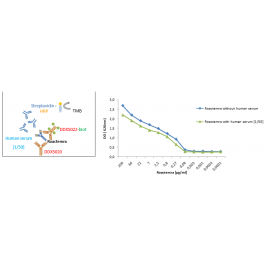 Detection antibody for Roactemra detection. Roactemra® (Tocilizumab) is a humanized antibody targeting the interleukine - 6 receptor. This immunosuppressive drug is mainly used for the treatm ent of rheumatoid arthritis and systemic juvenile idiopathic arthritis. We have generated a panel of anti - Roactem ra ( anti - Tocilizumab) murine monoclonal antibodies. These antibodies can be used to develop and calibrate Roactemra (Tocilizumab) and anti - Roactem ra ( anti - Tocilizumab) detection assays. - 20°C. KEEP CONTENTS STERILE: no preservative. Glycerol protects from freezing.